by Jessica Lewis	Posted in	Skin	on 16/08/2017 . As we age, we tend to get more and more visible lines and wrinkles, especially in ‘problematic areas’ such as the eyes. Many people seek to reduce these signs of aging, as this is typically one of the first places where you start to noticie them. One product that can greatly help reduce the appearance of lines and wrinkles around the eye area is the Obagi ELASTIderm Eye Treatment Cream for Normal/Dry Skin. Although results may vary from person to person, this product has been proved to rejuvenate the skin and improve the appearance of these aging signs in both normal and dry skin. Why Do You Have Lines and Wrinkles? Creams like these are effective because they target the cause of your lines and wrinkles. Our skin loses elasticity and develops creases and furrows over time, but age is not the only factor involved in the appearance of these blemishes. If you smoke, expose your skin to ultraviolet light on a regular basis, or smile/squint/frown a lot, then you’ll start to see these lines appear a lot sooner, as skin loses flexibility and is no longer able to snap back into place. 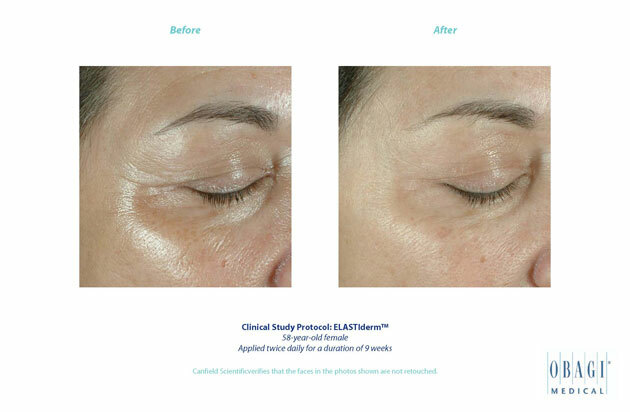 What is the Obagi ELASTIderm Eye Treatment Cream? The cream is unique, as it uses a revolutionary bi-mineral complex called Copper Zinc Malonate that helps to return your skin’s elasticity to its former glory. It restores elasticity by bringing back lift, snap and resilience to the delicate skin around your eyes. One of the best things about this rich cream is that is works for both normal and dry skin, which means it’s perfect for people who live in colder or hotter environments. The cream, from Obagi ELASTIderm uses a proprietary Restorative Elasticity Complex that is clinically proved to help replenish the skin’s elasticity, so you know you’re getting a high-quality product! The Obagi ELASTIderm Eye Treatment Cream has been helping patients to improve the appearance of lines and wrinkles around the eyes and to restore the elasticity of the skin. Because this cream does not rehydrate the superficial layer of the skin but rebuilds and replenishes the skin’s elastin and collagen fibres – this is the main cause of lines and wrinkles, so this cream helps to fight it at the source. Applying this cream from, Obagi ELASTIderm, is an easy and quick process, and will give you the results you’re looking for. Just start by cleansing your skin and apply small dots of the cream around your eye area, and don’t forget the eyelid, the corner and the zone under your eyes. Smooth the dots until the cream is completely absorbed. You should apply this product twice a day (morning and night) so that it’s working to reduce lines and wrinkles as you go about your daily life and when you’re sleeping. We have many other products you can experience to combat the signs of aging, such as our SkinCeuticals ECH A.G.E. Eye Complex and our SkinCeuticals Blemish and Age Defence. If you have any questions about these and other treatments we offer, get in touch with a friendly member of our team and we’ll discuss your needs with you.